Group 3 innate lymphoid cells (ILC3s) are important for intestinal health, particularly in controlling inflammation in response to epithelial dysregulation, but their role during homeostasis remains less well understood. We generated IL-22 reporter mice to assess production of this key cytokine by ILC3s in the small intestine during development and under basal conditions. Although IL-22 is produced by a variety of lymphocyte populations, constitutively high IL-22 expression was limited to lymphoid-tissue inducer (LTi) cells residing in lymph node–like structures in the gut called solitary intestinal lymphoid tissues (SILT). Constitutive IL-22 expression was dependent on the microbiota and MyD88 signaling, appeared upon weaning, and was present across the spectrum of SILT, including in cryptopatches. Activated SILT LTi cells colocalized with a rare subpopulation of activated macrophages constitutively positive for IL-12/23 p40 and capable of activating neonatal LTi cells in response to TLR stimulus. Thus, weaning leads to the organization of innate immune activation hubs at SILT that mature and are continuously sustained by signals from the microbiota. This functional and anatomic organization constitutes a significant portion of the steady-state IL-23/IL-22 axis. The intestinal immune system constitutes a diverse assemblage of cells reflecting the challenge of discriminatory responses to the abundant microbiota and fluctuating microbial and metabolic stimuli. The single cell–thick epithelia maintaining this barrier are key targets of IL-22, an epithelial growth factor produced by intestinal lymphocytes (1). Many intestinal lymphocytes produce IL-22, including αβ T cells, γδ T cells, and two types of Rorc-dependent group 3 innate lymphoid cells (ILC3s): NKp46+ ILC3s and NKp46− ILC3s, the latter including lymphoid tissue inducer (LTi) cells and adult LTi-like cells. Likewise, a variety of stimuli can induce IL-22 production from these cells, including IL-23, IL-1β, IL-6, lymphotoxin, and aryl hydrocarbon receptor ligands. The breadth of this system reflects the integral role of IL-22 as a mediator of intestinal barrier function and homeostasis. The role of IL-22 in intestinal health has been well described in the context of epithelial disruption, as occurs during Citrobacter rodentium infection (2–4) and dextran sulfate sodium–induced colitis (5, 6). These systems helped to establish that lymphocytes capable of IL-22 production are dispersed throughout the intestinal lamina propria, presumably within functional distance from target IL-22 receptor–expressing epithelial cells, intermingled with myeloid cells capable of inducing IL-22 (7). How and where IL-22 acts during homeostasis is less evident, although homeostatic function is suggested by impaired antimicrobial defense (8) and dysbiosis (9) that occurs in the absence of this cytokine or when upstream regulators are perturbed (10–13). However, one of the primary sources of IL-22 is LTi cells, which are preferentially clustered in anatomically distinct aggregates known as solitary intestinal lymphoid tissue (SILT) (14, 15). There are hundreds to thousands of SILT aggregates in mouse small intestine that comprise a continuum from nascent to fully developed B cell follicles, designated cryptopatches (CPs) and isolated lymphoid follicles (ILFs), respectively (16). Although existing within the submucosa of the lamina propria, these structures are akin to lymph nodes and are dependent on many of the same factors. Whereas CPs develop independently of the microbiota (17), their progeny ILFs require microbial sensing pathways (18, 19), suggesting that CPs are quiescent structures that develop into ILFs in response to microbial signals derived from the intestinal lumen. CD11c+ APCs residing in CPs are likely responsible, at least in part, for this sensing capability. However, little is known about how SILT-resident APCs relate to or can be distinguished from the dense network of related cells blanketing the lamina propria. Genetic models utilizing CD11c (10, 11) and CX3CR1 (12, 13) alleles have established a role for intestinal monocytes in IL-22 biology and provide evidence for dysbiosis and tissue alterations under steady-state conditions. This highlights the possibility that the effects of IL-22 in models of inflammation may also integrate its effects on baseline tissue homeostasis. This cryptic inflammation reveals that continuous immune surveillance of the microbiota is likely necessary to sustain epithelial health and supports a homeostatic role for IL-22 in these basal functions (20, 21). CD11c and CX3CR1, however, are broadly expressed by intestinal monocytes, including both macrophages and dendritic cells (22), and they therefore do not provide anatomic resolution as to whether and where these pathways are active in the intestinal landscape. To better understand the functional and anatomic axis in steady-state mouse intestine, we leveraged sensitive cytokine reporter mice to assay the localization and activation of critical cellular components of the IL-22 pathway. 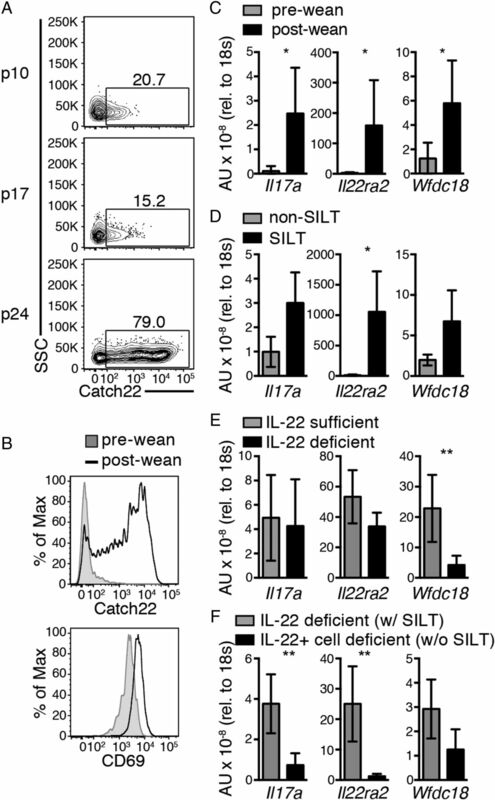 A unique Il22 reporter mouse revealed intense induction of IL-22 in SILT-localized LTi cells upon weaning. Also present at SILT was a subset of macrophages displaying heightened activation typified by induction of the IL-12 and IL-23 subunit IL-12/23 p40. Activity of these macrophages could be regulated by CpG, and CpG was capable of precociously inducing activation of LTi cells in neonatal mice. These data demonstrate that SILT are activated earlier than previously recognized and constitute a localizing site for IL-23–producing intestinal macrophages. Il22 reporter/knockout mice (Cre-associated transcript chasing IL-22 [Catch22 or C22]) were generated by homologous gene targeting in C57BL/6 embryonic stem cells. The previously published plasmid pKO915–diphtheria toxin (DT; Lexicon) was modified to express tdTomato in place of YFP, such that the cassette now contained (in order from 5′ to 3′) genomic sequence of the rabbit β-globin gene partial exons 2–3, the gene encoding tdTomato (Clontech), encephalomyocarditis virus internal ribosome entry site, humanized Cre recombinase, bovine growth hormone poly(A) tail, and a loxP-flanked neomycin resistance cassette. Approximately 3-kb homologous arms straddling the Il22 translation initiation site were amplified from C57BL/6 genomic DNA using Phusion polymerase (Finnzymes) and cloned into the cassette by standard methods. The construct was linearized with NotI and transfected by electroporation into C57BL/6 embryonic stem cells. Cells were grown on irradiated feeders with the aminoglycoside G418 in the media, and resistant clones were screened for 5′ and 3′ homologous recombination by PCR. Six clones were confirmed by PCR and two were selected for injection into albino C57BL/6 blastocysts to generate chimeras. The male chimeric pups with highest ratios of black-to-white coat color from each clone were selected to breed with homozygous CMV-Cre transgenic C57BL/6 females (B6.C-Tg(CMV-cre)1Cgn/J; 006054, obtained from The Jackson Laboratory) to excise the neomycin resistance cassette and subsequently to wild-type C57BL/6 to remove the CMV-Cre allele. Initial phenotyping of both clones did not reveal differences and one was selected for subsequent experiments. In most cases reporter heterozygous or homozygous males were bred to reporter heterozygous or C57BL/6 female mice, such that the dam was IL-22 sufficient whenever possible. C57BL/6J (000664), Yet40 (B6.129-Il12btm1Lky/J; 006412), CD11c-Cre (B6.Cg-Tg(Itgax-cre)1-1Reiz/J; 008068), Villin-Cre (B6.Cg-Tg(Vil1-cre)997Gum/J; 004586), MyD88-flox (B6.129P2(SJL)-Myd88tm1Defr/J; 008888), Rosa-DTα (B6.129P2-Gt(ROSA)26Sortm1(DTA)Lky/J; 009669), retinoic acid–related orphan receptor γt–GFP (B6.129P2(Cg)-Rorctm2Litt/J; 007572), IL-1 receptor knockout (B6.129S7-Il1r1tm1Imx/J; 003245), and IL-18 receptor knockout (B6.129P2-Il18r1tm1Aki/J; 004131) mice were from The Jackson Laboratory. All mice were maintained on standard chow and water, except for antibiotic treatment experiments in which they were maintained on ampicillin, metronidazole, neomycin (1 mg/ml each), and vancomycin (0.5 mg/ml) in 1% sucrose, from approximately embryonic day 14 to 4 wk of age. All mice were made using C57BL/6 embryonic stem cells or backcrossed at least 10 generations onto the C57BL/6 background and were maintained according to institutional guidelines in specific pathogen-free facilities at the University of California, San Francisco. For isolation of intestinal lamina propria for flow cytometry the small intestine, large intestine, and cecum were dissected separately, flushed extensively with cold PBS, and the mesenteric tissue was removed. Peyer’s patches and cecal patches were removed and in some cases processed and analyzed separately. Lymphoid structures were not removed from the large intestine lamina propria. The intestinal pieces were turned inside-out and shaken in four changes of 20 ml of cold PBS and washed for 20 min at 37°C in two changes of 20 ml of Ca2+/Mg2+-free HBSS containing 5 mM DTT, 5 mM EDTA, 10 mM HEPES, and 2% FCS, followed by 20 ml of Ca2+/Mg2+-replete HBSS containing 10 mM HEPES and 2% FCS. Tissues were digested for 30 min at 37°C in 5 ml of Ca2+/Mg2+-replete HBSS containing 10 mM HEPES, 2% FCS, 30 μg/ml DNase I (Roche), and 0.1 Wünsch/ml Liberase TM (Roche) and homogenized in C tubes using a gentleMACS tissue dissociator (Miltenyi Biotec). Homogenate was passed through a 100-μm filter, separated on a 40/90% Percoll gradient, and enumerated for staining equivalent numbers for flow cytometry. For analysis of the epithelial fraction, supernatant from the washes was saved, combined, filtered, and separated on a Percoll gradient as above, without digest. For isolation of punch biopsies, tissue was filleted and washed as above. Tissue was laid open in a petri dish, periodically bathed with cold PBS, and observed under low power with dsRed excitation using a Leica DM IL LED microscope with fluorescent illumination. SILT of ∼1 villus width or less were isolated using a 0.5-mm punch biopsy tool and digested as above. For staining of intracellular IL-22, lamina propria preparations were performed as above with the inclusion of 0.5 mg/ml brefeldin A (BioLegend) in all buffers until fixation for intracellular staining by standard procedures. The following Abs (from BioLegend, eBioscience, and Becton Dickinson) were used for staining: CCR6 (29-2L17), CD3 (17A2), CD4 (RM4-5), CD11b (M1/70), CD11c (N418), CD45 (30-F11), CD64 (X54-5/7.1), CD69 (H1.2F3), CD90.2 (Thy1; 53-2.1), CD103 (M290), CD172a (P84), c-Kit (ACK2), F4/80 (BM8), γδTCR (GL3), IL-22 (IL22JOP), Ly6C (RB6-8C5), MerTK (DS5MMER), MHC class II (MHC II; M5/114.15.2), NKp46 (29A1.4), TCRβ (H57), TLR3 (11F8), and TLR9 (M9.D6). Data were acquired with a Becton Dickinson LSR II or LSRFortessa and analyzed using FlowJo (Tree Star). Cell sorting was performed with a Beckman Coulter MoFlo XDP. Gating examples are provided in Supplemental Figs. 1B, 4E, and 4F. For analysis by immunofluorescence, tissues were harvested, flushed extensively with cold PBS, and filleted. For whole mount, filleted intestine was washed with DTT/EDTA and rinsed in HBSS, as for flow cytometry above. Intestinal pieces were laid flat between Whatman paper with light pressure for 4 h in 2% paraformaldehyde with 2 mM MgCl2 and 1.25 mM EGTA at 4°C, then washed overnight in excess PBS. For thin section, the tissue was also dehydrated in 30% sucrose for >4 h before rolling the tissue on a wooden stick, mounting in OCT as a “Swiss roll,” and cutting 8-μm sections with a cryostat. Thin sections were stained and mounted per standard procedures. Tissue for whole mount was stained in 0.5% Triton X-100 per standard procedures. Images were acquired and processed with a Zeiss Axio Imager 2 and Adobe Photoshop. For transcript analysis of 0.5-mm washed ileum or small intestine punches, tissue was homogenized in 1 ml of buffer RLT (Qiagen) in M tubes using a gentleMACS tissue dissociator and spun through a QIAshredder tube (Qiagen) prior to freezing at −80°C. Sorted cells were pelleted and frozen in buffer RLT. RNA was made from cell homogenate with the RNeasy mini or micro kit (Qiagen) and immediately transcribed into cDNA using SuperScript III reverse ranscriptase (Invitrogen). Quantitative PCR was performed using Power SYBR Green (Invitrogen) on an Applied Biosystems StepOnePlus and analyzed using Microsoft Excel. Primers were constructed from the Ensembl mouse (C57BL/6) genome database using Primer3Plus (http://primer3plus.com/cgi-bin/dev/primer3plus.cgi). The primers used were: 18S (forward: 5′-GAAACGGCTACCACATCCAAG-3′, reverse: 5′-TTACAGGGCCTCGAAAGAGTC-3′), Batf3 (forward: 5′-ACCCAGAAGGCTGACAAGC-3′, reverse: 5′-TCCTCCTTCAGCTTCGAAATC-3′), Il1b (forward: 5′-GGACCCATATGAGCTGAAAGC-3′, reverse: 5′-TTGTCGTTGCTTGGTTCTCC-3′), Il6 (forward: 5′-ACAAAGCCAGAGTCCTTCAGAG-3′, reverse: 5′-TGGAAATTGGGGTAGGAAGG-3′), Il10 (forward: 5′-GAATTCCCTGGGTGAGAAGC-3′, reverse: 5′-AATCACTCTTCACCTGCTCCAC-3′), Il12a (forward: 5′-AACCTGCTGAAGACCACAGATG-3′, reverse: 5′-GTTTGGTCCCGTGTGATGTC-3′), Il12b (forward: 5′-CATCTGCTGCTCCACAAGAAG-3′, reverse: 5′-GGTGCTTCACACTTCAGGAAAG-3′), Il17a (forward: 5′-AAGGCCCTCAGACTACCTCAAC-3′, reverse: 5′-TGAGCTTCCCAGATCACAGAG-3′), Il22 (forward: 5′-AATCGCCTTGATCTCTCCAC-3′, reverse: 5′-TTCTGGATGTTCTGGTCGTC-3′), Il22ra2 (forward: 5′-AAGCATTGCCTTCTAGGTCTC-3′, reverse: 5′-TGGACTGAAATCGGACCTTC-3′), Il23a (forward: 5′-CATGGAGCAACTTCACACCTC-3′, reverse: 5′-TAGAACTCAGGCTGGGCATC-3′), Irak3 (forward: 5′-AGGAATAGCCAAAGCCATCC-3′, reverse: 5′-GTTGGAGCTGGTCATCCAAG-3′), Klf4 (forward: 5′-TCTCATCTCAAGGCACACCTG-3′, reverse: 5′-TAGTGCCTGGTCAGTTCATCG-3′), Lta (forward: 5′-ACCCATGGCATCCTGAAAC-3′, reverse: 5′-GAGAAGCCATGTCGGAGAAAG-3′), Ltb (forward: 5′-GCAGTGCCTATCACTGTCCTG-3′, reverse: 5′-TTTCTGAGCCTGTGCTCCTG-3′), Tnfa (forward: 5′-CTCTTCTCATTCCTGCTTGTGG-3′, reverse: 5′-ATGAGAGGGAGGCCATTTG-3′), Wfdc18 (forward: 5′-TACTGCCTGGGCTCTGTCTAAC-3′, reverse: 5′-TCCTGTGCATCGTTCATCAC-3′), Zbtb46 (forward: 5′-GGTGATGATGGCTCACTTCTG-3′, reverse: 5′-GGGCACTTGAACTTCTTCCTG-3′). For analysis of cytokine potential, intestinal macrophages were sorted and pooled from five to six Il12bY40/Y40 mice and cultured at 18,000 cells per well of a nontreated U-bottom 96-well plate for 18–21 h. Culture medium was RPMI 1640 with 10% FCS, supplemented with 10 ng/ml GM-CSF (R&D Systems) with or without 2 μg/ml each low molecular mass and high molecular mass polyinosinic-polycytidylic acid [poly(I:C)] or 5 μM CpG (oligodeoxynucleotide 1826) (InvivoGen). Culture supernatants were harvested, stored at −80°C, and analyzed for cytokine production by cytometric bead array (Becton Dickinson). For activation of neonatal LTi cells in vivo, 12- to 14-d-old Il22C22/+;Il12bY40/Y40 mice were injected i.p. with either PBS, 2.5 μg of IL-23 (R&D Systems), 100 μg of CpG (oligodeoxynucleotide 1826), or 100 μg of poly(I:C) (InvivoGen) in 50 μl on 2 consecutive days for analysis on the third day. Charts and statistical analysis were performed using Prism (GraphPad Software). Where applicable, significance was determined using unpaired t tests with a Holm–Sidak correction for multiple comparisons with an α of 0.05. Otherwise, single t tests were used with the p value indicated in the figure legend. To assess the sources of IL-22 in healthy intestine, we generated a tdTomato-Cre knockin/knockout allele at the Il22 locus in C57BL/6 mice (Supplemental Fig. 1A) termed Catch22. Previous publications using other Il22 reporter mice did not assess the anatomic distribution of Il22+ cells in healthy small intestine (23, 24). Therefore, we first determined Catch22 fluorescence by whole-mount staining and found that cells expressing the reporter allele were present in discrete clusters throughout the small intestine, as assessed using native fluorescence (data not shown) or by Ab staining for the tdTomato protein (Fig. 1A–C). These clusters were SILT based upon their number and distribution, their colocalization with CD11c+ and VCAM1+ cells (25) after immunostaining (Fig. 1D), and their colocalization in larger clusters with B220+ B cells. Longer exposure times revealed cells more dim for tdTomato signal scattered throughout the lamina propria without a discernable spatial arrangement (data not shown). Small intestine LTi cells are constitutively activated at SILT. (A) Il22C22/+ murine small intestine was fixed and stained by whole mount for Catch22 (red) and B220 (green) (representative of n = 2). Scale bars, 1 mm. (B and C) Detail of the indicated regions from (A) to demonstrate small (B) and large (C) SILT structures. (D) Small intestine from Il22C22/+ mice was fixed, sectioned, and stained for Catch22 (red), CD11c (green), VCAM1 (light blue), and DAPI (gray) (representative of n = 5). Scale bars, 100 μm. (E) Lymphocytes were isolated from the proximal third of small intestine lamina propria and analyzed for Catch22 fluorescence among CD45+ cells (representative of n = 5). (F) ILC (Thy1+CD3−) subsets were analyzed for Catch22 and CD69 (representative of n = 4–7). (G) Small intestine lamina propria cells were isolated in the presence of brefeldin A and stained for intracellular IL-22 without exogenous stimulation. Data connected by line are from the same mouse (n = 5). *p < 0.05, **p < 0.01, ***p < 0.001 by t test. We focused on the SILT-resident cells, as they were the brightest and could be identified in flow cytometry by high levels of Catch22 signal. Flow cytometry of small intestine from 6-wk-old Il22C22/+ mice revealed that IL-22 was produced by Thy1+ cells, including CD4+ αβ T cells, γδ T cells, and ILCs (Thy1+ CD3−) (Fig. 1E, Supplemental Fig. 2A), as previously reported (23, 24). At steady-state, the absolute number of Catch22+ ILCs vastly outnumbered Catch22+ T cells. Among the ILC populations, a larger number of NKp46−c-Kithi than NKp46+ ILCs constitutively expressed the Catch22 allele, even though the total number of these two cell types was comparable (Supplemental Fig. 2B–D). In accordance with the immunofluorescence data, we found that Catch22 median fluorescence intensity (MFI) distinguishes the major ILC3 subtypes. Catch22hi ILCs in the steady-state intestine were almost entirely of the LTi cell phenotype, as defined by their CD3−, c-Kithi, NKp46lo (Fig. 1E, Supplemental Fig. 2E) and CCR6hi phenotype (Supplemental Fig. 2F), as well as abundant transcripts for lymphotoxins α and β (Supplemental Fig. 2G). Furthermore, and in conjunction with higher levels of Catch22 in NKp46−c-Kithi than NKp46+ ILCs, c-Kithi ILCs constitutively expressed higher levels of the lineage determinant retinoic acid–related orphan receptor γt (Supplemental Fig. 2H) and the activation marker CD69 (Fig. 1F). Finally, without exogenous stimulation Catch22hi cells and NKp46−c-Kithi ILCs produced more IL-22 protein (Fig. 1G) and Il22 message (Supplemental Fig. 2G) than did their counterparts. 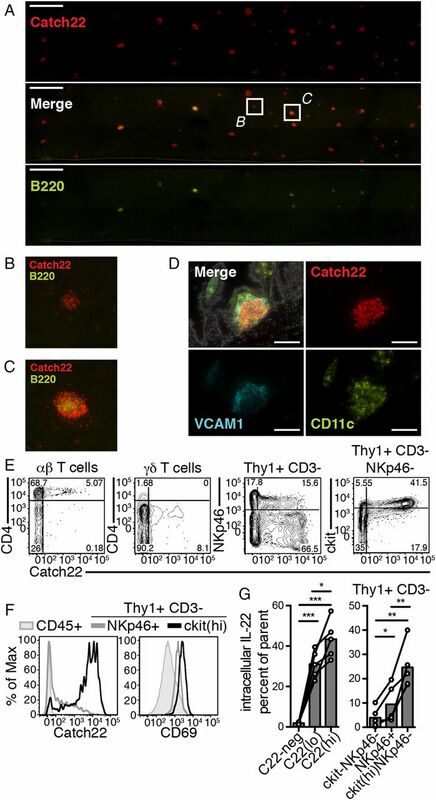 Thus, by comparing Catch22 and IL-22 signal intensity between immunofluorescence microscopy and flow cytometry we infer that Catch22hi cells were LTi cells residing in SILT, whereas Catch22lo cells were T cells and NKp46+ ILC3s dispersed throughout the villus lamina propria. Furthermore, we find that SILT in the resting small intestine identified focal areas of immune activity characterized by highly activated CD69+, IL-22–expressing LTi cells, myeloid cell clustering, and activated stromal cells (VCAM1+), even in the absence of infectious challenge. That SILT exhibited uniquely high levels of Catch22 expression was striking, as the common understanding of homeostatic IL-22 activity is in regulating epithelial antimicrobial tone, for example through induction of Reg3γ throughout the small intestine (2). Additionally, current models of SILT activity suggest that CPs are quiescent until they are induced by enteric microbes to develop into ILFs (1). Our data, however, indicated a refinement of this model such that CPs are in a constitutively active state prior to the induction of ILFs. To determine when this activity was initiated, we monitored spontaneous Catch22 fluorescence in the developing intestine. Catch22+ cells were present in prenatal mice at Peyer’s patch anlagen, although MFI was low (data not shown). Low MFI persisted until around weaning (postnatal day 21), when Catch22 MFI dramatically increased in T cells, NKp46+ ILC3s, and LTi cells to levels seen in adult animals (Fig. 2A, Supplemental Fig. 3A–C). 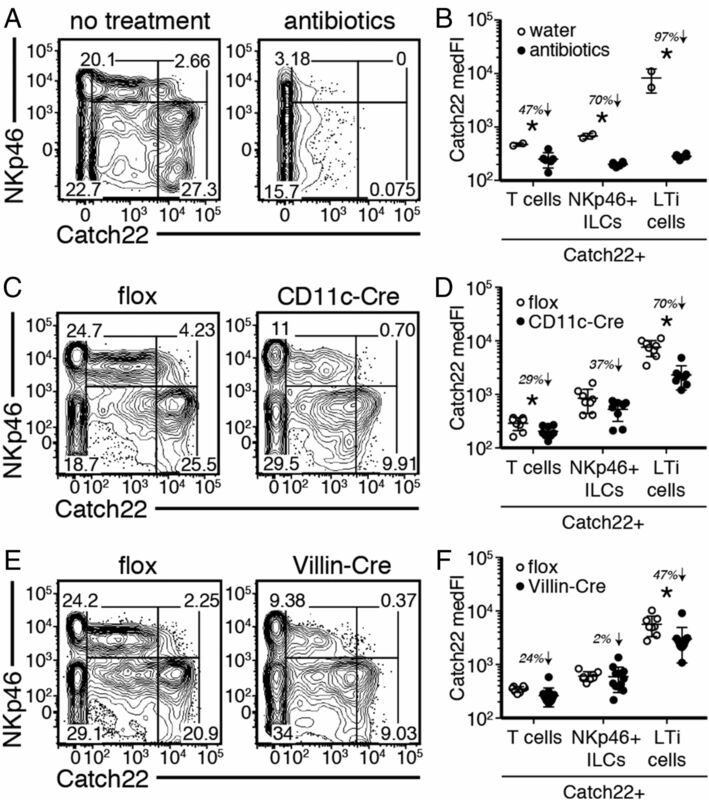 LTi cells expressed higher levels of Catch22 and CD69 (Fig. 2B) following weaning, indicating that IL-22 activation signals were concurrent with weaning. LTi cell activation is induced upon weaning. (A) Il22C22/+ small intestine lamina propria from 10- to 24-d-old mice was analyzed for Catch22 fluorescence in LTi cells. Peyer’s patches were removed from p17 and p24, but not p10, mice (representative of n = 6–9 per time point). (B) Catch22 and CD69 expression levels on LTi cells were compared between pre- and postweaning mice (representative of n = 6 each). (C–F) RNA/cDNA isolated from unfractionated distal ileum was processed for transcript analysis; from (C) pre- and postweaning mice (Il22C22/+; n = 3 each), (D) punch-dissected non-SILT and SILT from Il22C22/+ mice (n = 4–5 each), (E) IL-22–sufficient (Il22C22/+) and –deficient mice (Il22C22/C22; n = 5–6 each), and (F) IL-22–deficient mice with SILT (Il22C22/C22) and mice that delete IL-22–expressing cells and do not have SILT (Il22C22/C22;RosaDTa/+; n = 4 each). The tissue did not include Peyer’s patches. *p < 0.05, **p < 0.01 by t test. Concordantly with Catch22 expression and LTi cell activation, transcript analysis from unfractionated distal ileum demonstrated increases in Il17a, Il22ra2 (IL-22 binding protein [IL-22BP]), and the STAT3 target Wfdc18 (26) following weaning (Fig. 2C). Il17a is particularly interesting, as previous work has shown that among ILC3s Il17a is restricted to NKp46− cells (3, 27). We found that, similar to Il22, Il17a is induced upon weaning, is enriched in punch-dissected SILT, and is strongly reduced in the tissue when Catch22-expressing cells are deleted after crossing to a Rosa26-DTa allele (Fig. 2C–F), which lack SILT (Supplemental Fig. 3D–G). Likewise, whereas IL-22 receptor (Il22ra1) did not show preferential distribution (data not shown), the transcript for IL-22BP (Il22ra2), a negative regulator of IL-22 signaling (5), was also very highly enriched at SILT and dependent on Catch22-expressing cells (Fig. 2D, 2F). Thus, weaning is accompanied by a marked increase in immune activity highlighted by LTi cell activation and type 3 cytokine activity at SILT. It is thought that pathogenic microbes induce quiescent CPs to recruit B cells and that the resulting ILFs generate protective IgA in an LTi cell–dependent manner (28). Given the profound changes in the microbiota following weaning, we speculated that microbial sensing was also responsible for the vigorous activation of the Il22 locus at SILT in the healthy intestine. To determine whether a replete microbial flora was responsible not only for ILF development but also for pre-ILF SILT activation, we treated mice with broad-spectrum antibiotics from fetal through postweaning life. Suppression of the microbiota by antibiotics profoundly reduced the number of Catch22hi LTi cells, as well as the MFI of those that remained (Fig. 3A, 3B). This phenotype was also observed when antibiotics were given to adults (data not shown), demonstrating a constitutively active pathway that is not restricted to a developmental window. Consistent with the normal development of CPs in germ-free mice shown by others (17), the total numbers of ILC3 subsets were normal in antibiotic-treated mice, and Catch22dim SILT were present in thin sections of small intestine (data not shown). Microbial sensing drives homeostatic Il22 activity. (A and B) Il22C22/+ mice were treated with an antibiotic mixture from embryonic days 12–14 until analysis for Catch22 at postnatal day 29 (n = 2 or 6 mice). (C and D) Lamina propria from Il22C22/+;CD11c-Cre;MyD88flox/flox mice were analyzed for Catch22+ populations at 4.5 to 7 wk old (n = 8 each). (E and F) Lamina propria from Il22C22/+;Villin-Cre;MyD88flox/flox mice were analyzed for Catch22+ populations at 4 to 5 wk old (n = 8 or 13). (A, C, and E) Representative flow plots of ILC (Thy1+CD3−) populations. (B, D, and F) MFI of Catch22 in the indicated populations; italicized percentages indicate the reduction in Catch22 MFI relative to untreated or Cre− mice. Significance (*) was calculated with a Holm–Sidak multiple comparisons correction. Microbial sensing in the intestine occurs in multiple cellular compartments, many of which use the signaling adaptor MyD88 downstream of TLRs. We bred MyD88-flox mice to two Cre-expressing strains and monitored cellular activation using Catch22 fluorescence. Genetic deficiency of MyD88 in CD11c+ and Villin+ cells each resulted in a 50–70% reduction in Catch22 MFI in LTi cells (Fig. 3C–F). Lack of MyD88 in CD11c+ cells led to impaired Catch22 activation in NKp46+ ILC3 and LTi cells, whereas lack of MyD88 in Villin+ cells impaired Catch22 expression only in the LTi cell subset of ILC3. Catch22 was normal in IL-1 receptor knockout and IL-18 receptor knockout mice (Supplemental Fig. 3H, 3I), and preliminary data suggest that Asc knockout mice and mice deficient in IL-33 or IL-33 signaling have normal Catch22 or IL-22 levels at homeostasis (data not shown). These data suggest that TLR signaling was likely upstream of MyD88 at steady-state, although we have not formally excluded all other MyD88-dependent signaling pathways. Thus, similar to lamina propria–resident populations, steady-state LTi cells resident at SILT are dependent on the microbiota and MyD88 signaling for their activation. To define the cellular components upstream of Catch22 and SILT activation, we analyzed mice that express YFP under control of the endogenous Il12b (IL-12/23 p40) locus, known as “Yet40” (“Y40”) (29). Il12b is activated downstream of TLR signaling and there are known sources of both IL-12 and IL-23 within the intestine. In the context of colonization with segmented filamentous bacteria (30) or during C. rodentium infection (7), IL-23+ cells are suggested to be distributed across affected epithelium. In the healthy, steady-state small intestine, however, we found Yet40+ cells preferentially, although not exclusively, residing in discrete clusters with Catch22+ cells (Fig. 4A–D). In thin section the Yet40+ cell clusters were clearly SILT (Fig. 4E), corroborating evidence that SILT represent sites of immune activation in the healthy intestine. Il12b+ cells are also resident at CPs. (A) Il22C22/+;Il12bY40/+ or Il22C22/+;Il12bY40/Y40 murine small intestine was fixed and stained by whole mount for Catch22 (red) and Yet40 (green) (representative of n = 4). Scale bars, 1 mm. (B–D) Details of the indicated regions from (A). (E) Small intestine from Il12bY40/+ mice was fixed, sectioned, and stained for Yet40 (green), CD11c (red), CD172a (light blue), and DAPI (gray) (representative of n = 6). Scale bars, 100 μm. Yet40+ cells conformed to the phenotype of intestinal macrophages (31, 32) in that they expressed high levels of MHC II, CD11b, CD64, CD172a (SIRPα), F4/80, and MerTK, and they expressed intermediate levels of CD11c and CD103 (Fig. 5A, Supplemental Fig. 4A), were positive for intracellular TLR3 and TLR9 (Supplemental Fig. 4B), and expressed low levels of Zbtb46 transcript (Fig. 5B). Consistent with an intestinal macrophage phenotype, they also expressed higher levels of Il10 and Tnfa than did intestinal dendritic cells (CD11blo/−CD11chiMHC II+). Although a large number of MHC II+ cells in the small intestine are macrophages (CD11b+CD11cintCD64+), only 3–5% were also Yet40+ (data not shown), and it was these cells that harbored most of the IL-23 potential as well as higher levels of IL-1β and IL-6. It was intriguing that Yet40+ macrophages were also a major source of the IL-22 decoy receptor IL-22BP (Il22ra2) (Fig. 5B, Supplemental Fig. 4C) that we found to be highly enriched at SILT (Fig. 2D), suggesting their potential to negatively regulate the IL-22 activity of SILT-resident LTi cells. Yet40+ cells are macrophages. (A) Lamina propria from Il12bY40/Y40 mice was analyzed for Yet40 expression and the indicated markers. The Yet40+ gate was set based on a wild-type genetic control (representative of n = 6). (B) CD45+MHC II+ cells from small intestine lamina propria were sorted as Yet40+ macrophages (Yet40-pos Macs: CD11cintCD64+Yet40+), Yet40− macrophages (Yet40-neg Macs: CD11cintCD64+Yet40−), and dendritic cells (CD11c+CD64−). RNA/cDNA was prepared and analyzed for transcript levels (n = 5). *p < 0.05, **p < 0.01, ***p < 0.001, ****p < 0.0001 by t test. IL-12/23 p40 is a subunit of both IL-12 and IL-23. To determine whether Yet40 activation was indicative of IL-12 and/or IL-23 production, we compared sorted Yet40+ and Yet40− macrophages. Transcript analysis of sorted MHC II+ APCs indicated that Il23a transcript segregated to the Yet40+ cells with little, if any, Il12a expression detected in any population (Fig. 5B). Previous work indicated that CpG oligodeoxynucleotides elicited IL-22 from ILC3s cocultured with intestinal macrophages via IL-23 (7). In accordance with this observation, we confirmed that CpG induced IL-23 production from macrophage cultures (Fig. 6); however, only the small pool of Yet40+ macrophages released IL-23 in response to CpG. In contrast, the TLR3 agonist poly(I:C) was capable of inducing IL-23 production from macrophages regardless of pre-existing Il12b activity. Yet40+ macrophages also showed elevated production of IL-6 and TNF. Appreciable quantities of IL-12 were not detected under any of these conditions, suggesting that Yet40 expression in macrophages in vivo correlates with anatomic sites of IL-23 activity. These data demonstrate the existence of a coordinated interaction at SILT between Catch22hi LTi cells and activated macrophages capable of regulating them via IL-23. Yet40+ macrophages are more responsive to TLR stimulation. APCs were sorted from Il12bY40/Y40 mice and plated overnight in GM-CSF or GM-CSF with TLR3 [poly(I:C)] or TLR9 (CpG) ligand. Culture supernatants were analyzed for the indicated cytokines by cytometric bead array. IL-12/23 p40, IL-23 p19/p40, and IL-12 p35/p40 detections are not cross-reactive, per the manufacturer, such that the IL-12/23 p40 signal must represent p40 monomers or homodimers (n = 3 from pools of five to six mice each). The p values were calculated for Yet40+ versus Yet40− macrophages for each treatment. Similarities in microanatomic location and activation status between Catch22+ and Yet40+ cells suggested that these two cell types were coordinately regulated at SILT in steady-state mouse intestine and led us to speculate that Yet40+ macrophages would exhibit similar pre- to postweaning regulation as Catch22+ LTi cells. This hypothesis was not supported, however, as Yet40 reporter MFI was similar in pre- and postweaned mice (Fig. 7A). Despite this, Yet40+ APCs exhibited a dramatic increase in number in the periweaning period (Fig. 7B), coincident with the period of constitutive monocyte recruitment into the intestinal macrophage pool (33). Yet40+ macrophages are present and capable of inducing Catch22 prior to weaning. (A and B) Il12bY40/Y40 murine small intestine was analyzed for Yet40+ cells by flow cytometry, for Yet40 MFI among Yet40+ cells, normalized to a reporter-negative control (A) and total number of Yet40+ cells (B). Peyer’s patches were not removed from 2-, 5-, or 7-d-old mice (n = 2–11 per group). (C and D) Small intestine from 11-d-old (C) or 17-d-old (D) Il22C22/+;Il12bY40/Y40 mice was fixed and stained by whole mount for Catch22 (red) and Yet40 (green) (representative of n = 2 per time point). Scale bars, 100 μm. (E and F) Twelve- to fourteen-day-old Il22C22/+;Il12bY40/Y40 mice were injected i.p. with PBS, 2.5 μg of IL-23, 100 μg of CpG, or 100 μg of poly(I:C) on 2 consecutive days and analyzed on the third day for Catch22 MFI. Adults were untreated (n = 4–9 per group). Representative flow plots of LTi cells (E) and MFI of Catch22 in Catch22+ LTi cells (F). *p < 0.05, ***p < 0.001, ****p < 0.0001, t test significance versus neonatal PBS-treated mice. Constant YFP signal between pre- to postweaning Yet40+ macrophages and the lack of detectable cytokines from in vitro cultures without addition of TLR stimulus suggested that the YFP signal seen in steady-state macrophages did not indicate continual cytokine secretion. Rather, it likely represented either a primed state or episodic activation that was undetectable at the population level. Despite this, Yet40+ macrophages were found in preactivated SILT with Catch22dim cells prior to weaning (Fig. 7C, 7D), and we speculated that these cells would be capable of inducing Catch22 upon receipt of appropriate activating signals, as might occur due to changes in the microbiota following weaning. To test this, we treated neonatal mice with two consecutive doses of PBS, IL-23, CpG, or poly(I:C) and assessed Catch22 expression. Both IL-23 and CpG induced Catch22 in nearly all LTi cells (Fig. 7E), and to a lesser extent T cells and NKp46+ ILC3 (Supplemental Fig. 4D), whereas poly(I:C) affected only a fraction of LTi cells. More striking, however, was the ability of CpG to induce adult-like levels of Catch22, in contrast to both IL-23 and poly(I:C) (Fig. 7F). 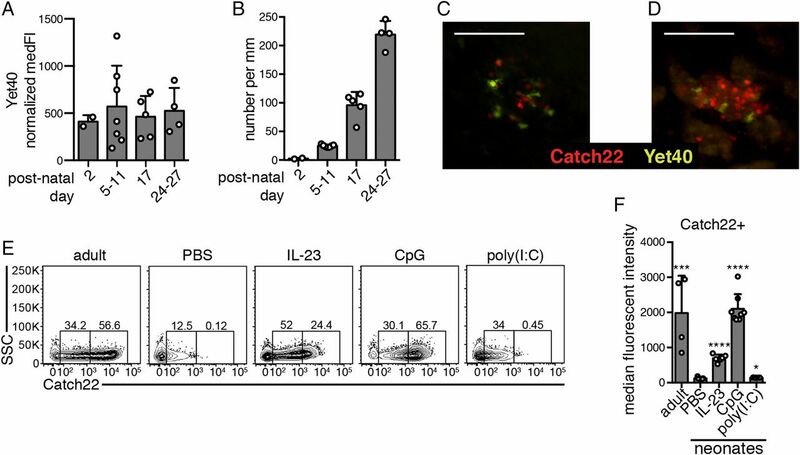 These data suggest that, upon weaning, colocalized Catch22+ LTi cells and Yet40+ macrophages can respond to specific microbial signals to initiate IL-22 signaling at specialized foci of the intestinal tissue. Using sensitive genetic cytokine reporter mice, we identify previously unrecognized homeostatic activity in the intestine and provide anatomic resolution as to where these activities are focused. These observations were highlighted by the colocalization of highly active, IL-22–expressing LTi cells and primed macrophages at anatomically segregated SILT structures. This macrophage subset produced more cytokine in response to TLR stimulation in vitro, and MyD88 deficiency in these cells abrogated LTi cell activation in vivo. Although both LTi cells and macrophages were present at SILT early in life, this circuit remained quiescent until weaning, thereby identifying pre-ILF SILT structures as anatomically restricted immune hubs that couple sensing of microbial signals with tightly regulated immunologic maturation during this critical developmental milestone. Recently, two other Il22 reporter mice were generated. Analysis of these reagents either focused on T cells (24) or used the Il22 locus to fate map cells (23), which prevented observations of transcriptional intensity and temporal control. In contrast, we focused on real-time Il22 activity, with particular attention to reporter intensity and spatial distribution of reporter-positive cells. This allowed us to make two novel observations regarding IL-22 production by intestinal ILC3s. First, LTi cells in the healthy intestine were more active than their NKp46+ counterparts. The potency of LTi cells for IL-22 production has been noted in the literature (34–36), but thus far an appreciation of this distinction and their particular anatomic distribution in SILT is not integrated into models of ILC3 activity and intestinal homeostasis. Although NKp46+ ILC3 have been found at small SILT (8), our data are in accordance with a recent report demonstrating that NKp46+ and lamina propria ILC3 are controlled by the chemokine receptor CXCR6, whereas LTi cells and SILT-resident ILC3 are not (13), reflecting a functional and anatomic axis highlighted by our work. The Catch22 allele allowed us to functionally identify NKp46− ILC3s irrespective of CD4 expression and easily localize their distribution within the small intestine, and clearly indicated the dominant capacity of LTi cells for IL-22 production and heightened activity in healthy intestine. Indeed, although the importance of NKp46+ ILC3s in many processes is well supported, recent studies suggest an unappreciated contribution from LTi cells in commonly used models of intestinal pathology (4, 34). These data together with our observations prompt a reevaluation of disease susceptibility in germ-line knockout mice (Il22, Rorc, Ahr, lymphotoxin), which may have an altered baseline intestinal immune tone owing to disrupted LTi cells and/or IL-22 activity, as was demonstrated previously (9). Second, use of the Catch22 allele revealed the kinetics of SILT activation. SILT-resident LTi cell activation coincided with weaning and it was dependent on a replete intestinal flora, MyD88 signaling in CD11c+ and Villin+ cells, and did not require IL-1 receptor or IL-18 receptor. Preliminary data also suggest that other IL-1 family members are not required for steady-state LTi cell activation, suggesting that cells at SILT actively survey the microbiota and elicit Il22 activity regardless of SILT size or the presence or absence of B cells. Therefore, our work adds to a number of previous studies (37–42) highlighting the importance of a replete intestinal flora for steady-state IL-22 levels. These results are, however, contradicted by a previous report (43) showing diminishing activity from LTi cells taken from 8-wk-old compared with 2-wk-old mice, as well as suppression of IL-22 by the microbiota. We cannot resolve this contradiction, but it is possible that stimulation of the cells in that study, as opposed to ex vivo and in situ analysis in our work, or institutional colony differences, could be responsible. The observed activation event at SILT upon weaning is a significant refinement to the current model of secondary lymphoid tissue development in gut lamina propria, which posits that microbial sensing and activation directly leads to the generation of a B cell follicle (18, 19). We identified a microbiota-regulated activation event at SILT exclusive of that which induces a B cell follicle, as evidenced by LTi cell activation irrespective of SILT size or follicle development. Nevertheless, microbial sensing is necessary for the induction of a B cell follicle at SILT, and IL-22 is important to this process (44), at least in the large intestine. Therefore, we hypothesize that two microbiota-dependent activation events operate on SILT: 1) a signal received by small, quiescent SILT at weaning leading to activation of LTi and possibly other cells, and 2) a signal received by small, activated SILT leading to B cell recruitment and elaboration of a productive follicle. Future studies should be directed toward identifying what distinguishes these two microbiota-dependent events, as the latter may involve inflammatory signals generated by tissue damage or cytoplasmic microbial sensing as would occur following pathogenic insults. 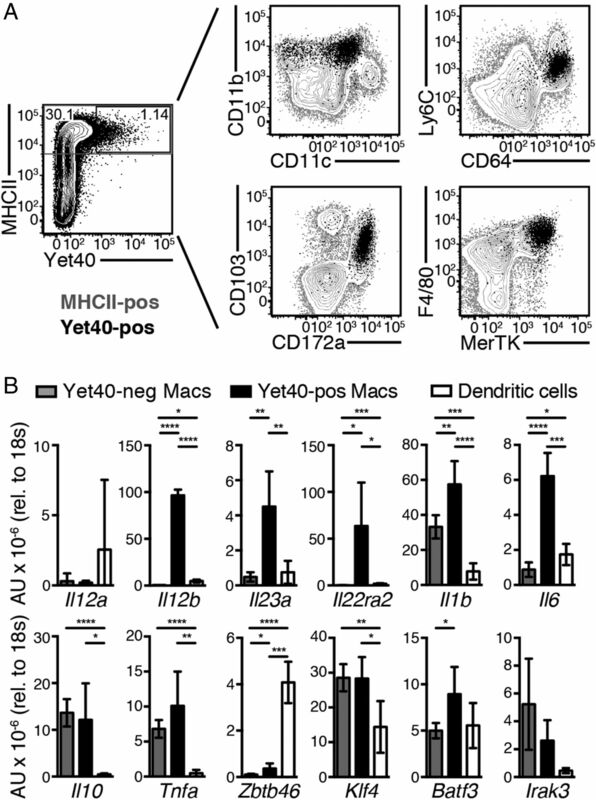 Use of Yet40 reporter mice, which express YFP from the Il12b locus, provided a way of observing a functional–anatomic link within the large macrophage population of the small intestine. Yet40 mice revealed that a small fraction of intestinal APCs were activated at steady-state and anatomically segregated with IL-22–expressing SILT-resident LTi cells. We did not observe SILT of any size that did not also harbor Yet40+ cells. Thus, at least three activated populations reside at SILT at steady-state: VCAM1+ stromal cells (25), Catch22+ LTi cells, and Yet40+ APCs. Yet40+ cells also accumulated through the periweaning period, suggesting that the induction of Catch22 at SILT coincided with Yet40 residency at these structures. We did not find an increase in Yet40 MFI to mirror that of Catch22, but it is formally possible that during weaning the Yet40+ pool reaches a critical mass at SILT for induction of Catch22hi LTi cells. Other formal possibilities coincident with weaning are the induction of an accessory factor (other than Il12b) in Yet40+ cells or other SILT-resident cells, or release of an inhibitory brake on LTi cell activation, although we did not address these possibilities. Yet40+ small intestine APCs were identified as macrophages based on a variety of markers and the lack of Zbtb46 transcript associated with the dendritic cell lineage (31, 32). Small intestine Yet40+ macrophages were more responsive to TLR stimulation than their Yet40− counterparts and were capable of producing factors, for example, IL-23, which potently activated LTi cells. The identification of this small fraction of Yet40+ macrophages as part of a steady-state network of IL-22 production expands upon previous work (11) and is a significant advancement over existing genetic tools (e.g., CD11c, CX3CR1) that label most APCs in the intestine (22). Our findings enable a significantly more refined analysis of IL-22–dependent homeostasis and immune activation. In concordance with previous studies (7), in vitro stimulation with TLR9 ligand CpG had the most profound effect on Yet40+ macrophages. The ability of CpG to elicit substantial levels of IL-12/23 p40 and IL-23 exclusively from Yet40+ macrophages in vitro and induce adult-like levels of Catch22 from neonatal mice in vivo suggests that TLR9 has an important role in establishing and maintaining steady-state IL-22 production. In fact, prior reports identified a role for CpG/TLR9 in wound healing and intestinal tolerance (45–47), implicating Yet40+ macrophages in these protective responses. Although these studies did not assess IL-22 levels or SILT activation, our data suggest that one consequence of CpG administration is the activation of SILT-resident macrophages. In fact, islet allograft survival is enhanced by CpG administration resulting in enhanced IL-23 and IL-22 production (48). Therefore, Yet40+ macrophages residing in SILT may be able to acquire and detect microbial products for the production of tissue-protective factors. Curiously, these same macrophages also appear to be a major source of steady-state IL-22BP. Our data demonstrate that in the small intestine Il22ra2 transcript anatomically correlated with SILT, genetically depended on the presence of SILT, and was expressed much more highly in Yet40+ macrophages than in other macrophages, dendritic cells, or T cells. A recent report confirms some of these findings (49). This additional layer of IL-22 regulation appeared in concert with induction of IL-22 activity, as it appeared after weaning. IL-22BP negatively regulates IL-22 activity (50, 51) and was shown to limit chemically induced colon carcinomas (52). Additionally, it was previously shown that IL-22BP expression is induced by retinoic acid (53) and suppressed by IL-18 (52), both of which are known epithelial products also linked to IL-22 activity (54–56). These observations suggest a model whereby SILT are signal integration platforms organized around microbe-sensing Yet40+ macrophages that represent both sources of IL-23 and IL-22BP, and potential regulatory targets of retinoic acid and IL-18. Although study of intestinal ILC3s and macrophage populations continues to be hampered by a lack of specific tools, the resolution provided by these functionally encoded genetic models allowed us to observe developmental and homeostatic processes not previously appreciated. Whether this system in mice reflects human biology remains unclear. It is generally considered that there are no CPs in human intestine (16), although recent evidence questions this conclusion (57, 58), and it is possible that the widespread CPs present in mouse intestine reflects a human developmental stage captured in specific pathogen-free mouse colonies. Irrespective of a direct CP correlate, human as well as mouse intestine commonly exhibit hypercellular, engorged, villi containing abundant APCs and VCAM1+ stromal cells, as well as IL-22–expressing cells (Refs. 59, 60 and data not shown). Although the etiology and function of these structures are unknown, their common cellular constituents may indicate pathways shared with CP and ILF development. Future work focusing on the interactions occurring between activated macrophages and IL-22–producing LTi cells during SILT progression and at inflammatory foci will be important in unraveling the pre-emptive formation of such structures and the capacity to sustain intestinal homeostasis. The tools we describe will be important in examining this process. We thank Z. Wang, M. Ji, M. Consengco, and N. Flores for technical expertise, and Z. Wang, J. Schanin, and members of the Locksley laboratory for helpful discussions. R. Taniguchi, A. Molofsky, S. van Dyken, and J. Nussbaum provided helpful comments on the manuscript. This work was supported by National Institutes of Health Grants AI30663 and HL128903 and the Howard Hughes Medical Institute. A.K.S. is a Howard Hughes Medical Institute fellow.
. 2015. Interleukin-22: immunobiology and pathology. Annu. Rev. Immunol. 33: 747–785.
. 2016. Complementarity and redundancy of IL-22-producing innate lymphoid cells. Nat. Immunol. 17: 179–186.
. 2015. Unique and redundant functions of NKp46+ ILC3s in models of intestinal inflammation. J. Exp. Med. 212: 1869–1882.
. 2008. IL-22 ameliorates intestinal inflammation in a mouse model of ulcerative colitis. J. Clin. Invest. 118: 534–544.
. 2014. CX3CR1+ mononuclear phagocytes support colitis-associated innate lymphoid cell production of IL-22. J. Exp. Med. 211: 1571–1583.
. 2009. RORγt and commensal microflora are required for the differentiation of mucosal interleukin 22-producing NKp46+ cells. Nat. Immunol. 10: 83–91.
. 2013. IL-22 deficiency alters colonic microbiota to be transmissible and colitogenic. J. Immunol. 190: 5306–5312.
. 2012. Depletion of dendritic cells enhances innate anti-bacterial host defense through modulation of phagocyte homeostasis. PLoS Pathog. 8: e1002552.
. 2012. Interleukin 23 production by intestinal CD103+CD11b+ dendritic cells in response to bacterial flagellin enhances mucosal innate immune defense. Immunity 36: 276–287.
. 2011. CX3CR1 regulates intestinal macrophage homeostasis, bacterial translocation, and colitogenic Th17 responses in mice. J. Clin. Invest. 121: 4787–4795.
. 2014. The chemokine receptor CXCR6 controls the functional topography of interleukin-22 producing intestinal innate lymphoid cells. Immunity 41: 776–788. 2005. Inducible lymphoid tissues in the adult gut: recapitulation of a fetal developmental pathway? Nat. Rev. Immunol. 5: 413–420.
. 2006. Adaptation of solitary intestinal lymphoid tissue in response to microbiota and chemokine receptor CCR7 signaling. J. Immunol. 177: 6824–6832.
. 2005. Cryptopatches and isolated lymphoid follicles: dynamic lymphoid tissues dispensable for the generation of intraepithelial lymphocytes. Eur. J. Immunol. 35: 98–107.
. 1996. 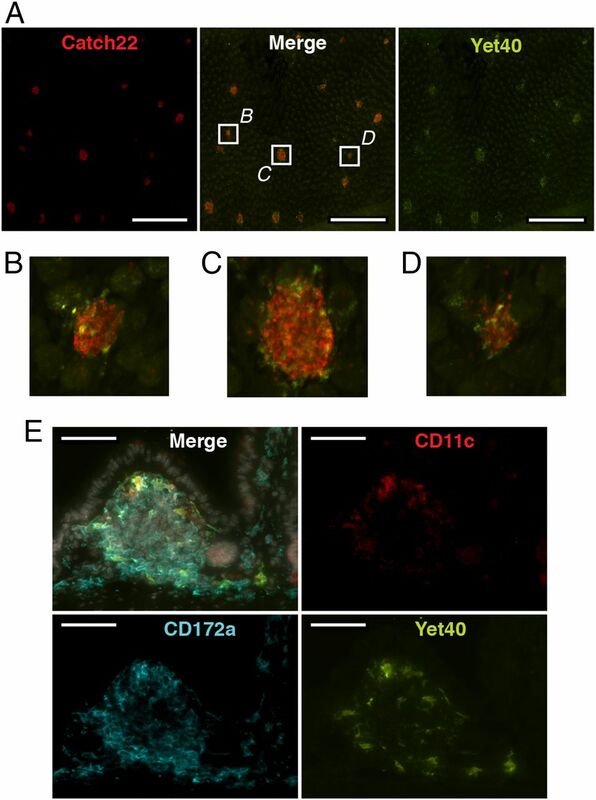 Identification of novel lymphoid tissues in murine intestinal mucosa where clusters of c-kit+ IL-7R+ Thy1+ lympho-hemopoietic progenitors develop. J. Exp. Med. 184: 1449–1459.
. 2003. Isolated lymphoid follicle formation is inducible and dependent upon lymphotoxin-sufficient B lymphocytes, lymphotoxin beta receptor, and TNF receptor I function. J. Immunol. 170: 5475–5482.
. 2008. Lymphoid tissue genesis induced by commensals through NOD1 regulates intestinal homeostasis. Nature 456: 507–510.
. 2014. The IL-20 subfamily of cytokines—from host defence to tissue homeostasis. Nat. Rev. Immunol. 14: 783–795.
. 2014. Homeostatic IL-23 receptor signaling limits Th17 response through IL-22–mediated containment of commensal microbiota. Proc. Natl. Acad. Sci. USA 111: 13942–13947.
. 2014. The monocyte-macrophage axis in the intestine. Cell. Immunol. 291: 41–48.
. 2014. IL-22 fate reporter reveals origin and control of IL-22 production in homeostasis and infection. J. Immunol. 193: 4602–4613.
. 2016. IL-22-expressing murine lymphocytes display plasticity and pathogenicity in reporter mice. Front. Immunol. 6: 662.
. 2004. Intestinal cryptopatch formation in mice requires lymphotoxin α and the lymphotoxin β receptor. J. Immunol. 173: 7183–7189.
. 2009. STAT3 links IL-22 signaling in intestinal epithelial cells to mucosal wound healing. J. Exp. Med. 206: 1465–1472.
. 2015. Transcriptional programs define molecular characteristics of innate lymphoid cell classes and subsets. Nat. Immunol. 16: 306–317.
. 2012. Isolated lymphoid follicles are dynamic reservoirs for the induction of intestinal IgA. Front. Immunol. 3: 84.
. 2006. Visualization of IL-12/23p40 in vivo reveals immunostimulatory dendritic cell migrants that promote Th1 differentiation. J. Immunol. 177: 1618–1627.
. 2009. Induction of intestinal Th17 cells by segmented filamentous bacteria. Cell 139: 485–498.
. 2013. Dendritic cell subsets in the intestinal lamina propria: ontogeny and function. Eur. J. Immunol. 43: 3098–3107.
. 2012. CD64 distinguishes macrophages from dendritic cells in the gut and reveals the Th1-inducing role of mesenteric lymph node macrophages during colitis. Eur. J. Immunol. 42: 3150–3166.
. 2014. Constant replenishment from circulating monocytes maintains the macrophage pool in the intestine of adult mice. Nat. Immunol. 15: 929–937.
. 2011. CD4+ lymphoid tissue-inducer cells promote innate immunity in the gut. Immunity 34: 122–134.
. 2011. Lymphotoxin controls the IL-22 protection pathway in gut innate lymphoid cells during mucosal pathogen challenge. Cell Host Microbe 10: 44–53.
. 2009. CXCL13 expression in the gut promotes accumulation of IL-22-producing lymphoid tissue-inducer cells, and formation of isolated lymphoid follicles. Mucosal Immunol. 2: 486–494.
. 2016. Germ-free and antibiotic-treated mice are highly susceptible to epithelial injury in DSS colitis. J. Crohn’s Colitis 10: 1324–1335.
. 2016. Lymphoid-tissue-resident commensal bacteria promote members of the IL-10 cytokine family to establish mutualism. Immunity 44: 634–646.
. 2015. Increased expression of DUOX2 Is an epithelial response tomucosal dysbiosis required for immune homeostasis in mouse intestine. Gastroenterology 149: 1849–1859.
. 2013. Tryptophan catabolites from microbiota engage aryl hydrocarbon receptor and balance mucosal reactivity via interleukin-22. Immunity 39: 372–385.
. 2016. Phenotypic and functional plasticity of murine intestinal NKp46+ group 3 innate lymphoid cells. J. Immunol. 196: 4731–4738.
. 2011. RORγt+ innate lymphoid cells regulate intestinal homeostasis by integrating negative signals from the symbiotic microbiota. Nat. Immunol. 12: 320–326.
. 2011. IL-22 bridges the lymphotoxin pathway with the maintenance of colonic lymphoid structures during infection with Citrobacter rodentium. Nat. Immunol. 12: 941–948.
. 2013. CpG-oligodeoxynucleotide treatment protects against ionizing radiation-induced intestine injury. PLoS One 8: e66586.
. 2009. Neonate intestinal immune response to CpG oligodeoxynucleotide stimulation. PLoS One 4: e8291.
. 2009. Reciprocal expression and signaling of TLR4 and TLR9 in the pathogenesis and treatment of necrotizing enterocolitis. J. Immunol. 182: 636–646.
. 2016. A TLR9 agonist promotes IL-22-dependent pancreatic islet allograft survival in type 1 diabetic mice. Nat. Commun. 7: 13896.
. 2017. IL-22BP dictates characteristics of Peyer’s patch follicle-associated epithelium for antigen uptake. J. Exp. Med. 214: 1607–1618.
. 2003. Cloning and characterization of mouse IL-22 binding protein. Genes Immun. 4: 204–211.
. 2016. A pathogenic role for T cell–derived IL-22BP in inflammatory bowel disease. Science 354: 358–362.
. 2012. IL-22BP is regulated by the inflammasome and modulates tumorigenesis in the intestine. Nature 491: 259–263.
. 2014. Interleukin-22 binding protein (IL-22BP) is constitutively expressed by a subset of conventional dendritic cells and is strongly induced by retinoic acid. Mucosal Immunol. 7: 101–113.
. 2013. Retinoic acid expression associates with enhanced IL-22 production by γδ T cells and innate lymphoid cells and attenuation of intestinal inflammation. J. Exp. Med. 210: 1117–1124.
. 2016. Vitamin A controls the presence of RORγ+ innate lymphoid cells and lymphoid tissue in the small intestine. J. Immunol. 196: 5148–5155.
. 2015. Interleukin-22 induces interleukin-18 expression from epithelial cells during intestinal infection. Immunity 42: 321–331.
. 2013. Cryptopatches are essential for the development of human GALT. Cell Reports 3: 1874–1884.
. 2010. CCR6 identifies lymphoid tissue inducer cells within cryptopatches. Clin. Exp. Immunol. 160: 440–449.
. 2013. Ectopic lymphoid tissue alters the chemokine gradient, increases lymphocyte retention and exacerbates murine ileitis. Gut 62: 53–62.
. 1998. Lymphocyte-filled villi: comparison with other lymphoid aggregations in the mucosa of the human small intestine. Gastroenterology 115: 1414–1425.